This month, in this Season of Giving, I want to share a story that my friend Ben Smelser wrote. Ben is a back-slidden banjo student, a bass player, and father of Tip Jar Jam fashionista Kasey Smelser. I’ve shared some of Ben’s wisdom before and I’ve also shared some of his non-wisdom, like the time he kept working on Fireball Mail after Casey Henry, his banjo teacher, told him not to! The Universe dropped Ben into our lives when one of my students backed into tree alongside our driveway and I decided to have the offending object removed. (Tree, not student!) Thus, I stumbled onto Smelser’s Tree Service. This tree removal begat banjo lessons and which begat playmates for grandson Dalton (Ben, Kasey, and his grandson Cam), which begat a babysitter for Dalton (Kasey), which begat a friendship between two families. When we visited Ben’s family for a Fourth of July party, I admired the gorgeous table he’d made for his wife, Tina, and I said I’d love to have a table like that. Ben being Ben, the rest is history. Here is the story, originally handwritten, that Ben delivered along with the table. I am your table. If you are reading this, then I have made it into the home in which I will stay. You see, I wasn’t always like this. So take a second and admire my beauty. Many years ago I stood tall and proud. I was a walnut tree in a family’s yard. I’ve seen many seasons come and go. I’ve survived powerful thunderstorms, crippling ice, blazing hot summers, droughts, and snow up to my first limb. My canopy was huge and it shaded the family home and the children who played under me. I’ve seen a lot. I’ve held the nest of many robins and watched the mother care for and nurture her young until they took flight. Squirrels would race across my limbs gathering nuts. Kids would swing from my branches. An old man napped in his hammock while I held him and I cherished that. I became two-inch planks, then I was put away to dry for a year. He brought me out and checked my moisture again. Too high. I waited another year. Then just this past month, November 2015, he brought me out. I was just right. What was I to become? What is this table thing he speaks of? As the man and his friend Justin began to put me together I could see by their passion that I was to become something great. I was glued together to become a solid massive top trimmed all the way around with some of my best heart wood. And my legs! I never would have thought that I could have legs like that. He sanded them down to be silky smooth and would constantly comment on how gorgeous they were. Way to make me blush! Then my benches were joined together and braced for sturdiness. But I still didn’t know why he had the passion and desire to build me so strong and beautiful. Then when all the work was done and I was gleaming with a bright finish he sat down with me and said, “These people you are going to stay with mean a lot to me. Like them, you are special! Unlike all other pieces of furniture, you, the kitchen table, are unique. As you did when you were a tree, again you will see much. Your table top will carry the loads of many meals, for many seasons, and many holidays. You will hear the prayers day in and out of those who sit with you. Coffee and tea will be shared with visitors and friends. You will witness joyous occasions and celebrations. You will also have to absorb the tears in times of suffering. There will be kids who scratch and mark and color all over you. But enjoy it for they grow quick. Your legs must be strong enough to carry all this. Sometimes the weight of a heavy elbow and worrisome soul may test your strength. But stay strong. I heard him mention names. Red and Murphy, Casey, Dalton, Sean, and Chris. I guess you are the folks I am here for. I know there was a lot of love put into making me, so I’m hoping to always make you proud for I am your family’s Walnut Kitchen Table! Posted in By Murphy, General and tagged story, table on December 15, 2016 by Murphy Henry. It would make a beautiful backdrop for a Winarsky bowl…which would only enrich an already great story. Would love to have one of Ira’s bowls! God rest his sweet banjo picking soul. How would I get one? BEAUTIFUL table and beautiful story!! If ONLY our tables could talk!! Merry Christmas Red & Murphy and family! Great story. As a “furniture guy” most of my life, I really appreciated it. 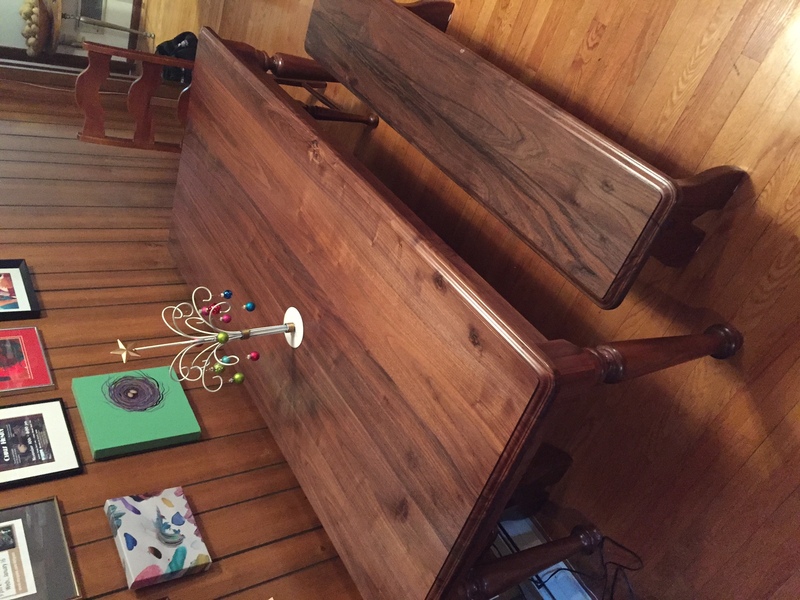 This beautiful Walnut kitchen table & bench made by Ben and the story it told you…..brought me to tears. Murphy, you should write a song with the words from this wonderful walnut tree. You are very fortunate to have such a friend as Ben!! That is the best Christmas story ever. So touching, it brought tears to my eyes. I miss all you guys from class. A very Merry Christmas and a Happy Healthy 2017.